Editors Note: Lisbeth Lopez Silva will now be facing Brenda Enriquez. Kyra Batara withdrew from the commitment due to a strain in her back and neck. 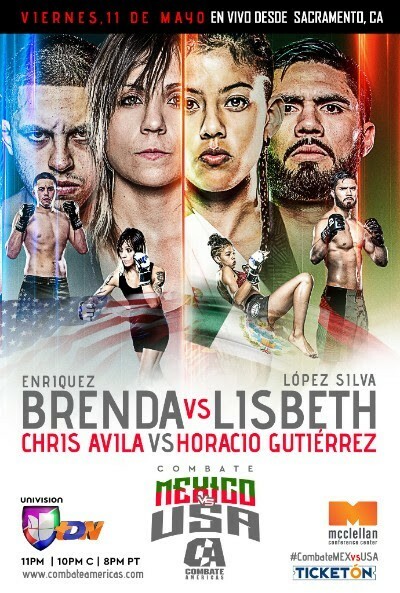 The young Mexican Mixed Martial Artist Lisbeth “Bunny” Lopez Silva will be a different person when she walks inside the jaula—cage–this weekend at Combat Americas. The 21-year-old fighter will be competing against Kyra Batara in a battle for the number one spot in the atom weight division. Combate Americas will air on Univision at midnight eastern time, Friday, May 11. The Roman Show spoke to Silva days before her fight. Both of riding on a winning streak. Silva said she hopes to bring heavy hands to the cage. Silva made her Combate America debut with a submission victory over Nicdali Rivera-Calanoc and prior she knocked out veteran Sheila Padilla. She understands her opponent is the favorite, but that only motivates her more.